I caught a fascinating clip on Facebook over the weekend from a 1961 Australian interview show called “Women’s World.” (The clip is below.) The topic is at hand is Education for Married Women, i.e., whether or not it’s a waste for married women to be educated. It provides an interesting glimpse into the mindset of the time, but it wasn’t the topic itself that interested me, it was contrast between the two women being interviewed: Chipper, ambitious pharmaceutical chemist Jean, and vaguely misanthropic champion of underachievement, Toni, who is trained as a kindergarten teacher. Jean is clearly energetic and bright, but I find Toni strangely likable. I don’t agree with her ideas—Toni insists that a university education makes women unhappy, “fogs” their minds up with nonsense, and overstimulates them, making them loathe to perform their proper duty to stay home with children. She further opines that children are given far too much homework and that they should leave the books at school and just come home and watch the telly. When Jean points out that there is a danger of housewives getting stuck in a “nice little rut” where they don’t want to bother with anyone else, Toni huffs “Well, that’s best thing that can happen to a woman, in my opinion.” Clearly not career-oriented, Toni’s only regret is that she never learned to type, so if her husband died, she’d have to go teach kindergarten again and she’s getting a little old for that. Of the two, Toni seems like she would be far more fun to hang out with. Toni would whip up a batch of warm chocolate chip cookies, pour you a cold glass of milk, and tell you stop tiring your mind with intellectual nonsense. She’d have all the best gossip and call people fools a lot. And I don’t know for sure, but I suspect she’s really into detective shows. Jean is lovely, but as a no-getter myself, Toni would be my top choice to pal around with. Speaking of no-getting, I have no New Year’s Resolutions, as per usual. I think they are a terrible idea. (I bet you Toni would agree.) But I did get off my as-of-late sedentary buttocks this morning to go swimming and see if I could shake some of stiffness out of my left leg. What used to be a left-knee issue seems to have turned into a whole-left-leg issue. The other night I woke up with spasms in a lateral muscle I then had to go look up the name of. It was a bit bizarre. It took about ten minutes to calm it down, and it seems to have come out of nowhere. The swimming helped, but the aches came back once I got on dry land again. Maybe my New Year’s Resolution should be to get a massage every week. However, I may need to rethink my no-getterness when it comes to writing, because I recently had a dream about the Egyptian god Thoth. He wrote a message on a scroll for me and was very insistent that I read it. In the space between dreaming and waking, I was desperately trying to remember the message, but of course it was gone the second I woke up. I do not why I was visited by Thoth. I had to go and look him up because I had no memory of who he was in the Egyptian pantheon. 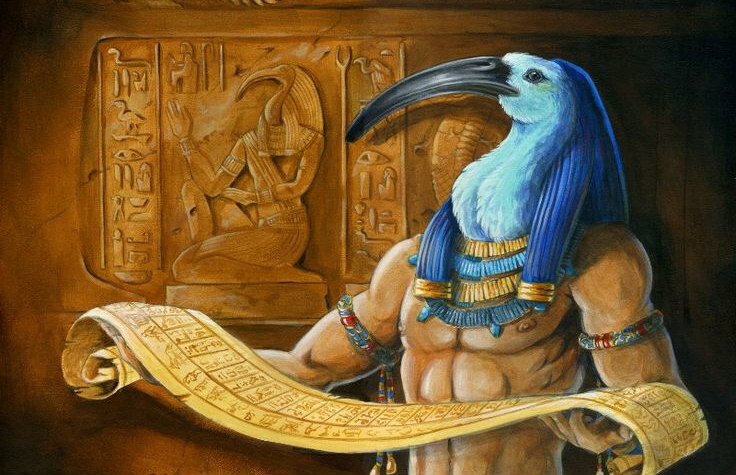 It turns out that among other things, Thoth was the patron of scribes and of the written word. He maintained the library of the gods, was said to have created himself through the power of language, and wrote a song that created the eight deities of the Ogdoad. So I was visited by the one of the big dogs, and I don’t care who thinks that’s loopy, I believe in paying attention to that kind of stuff.